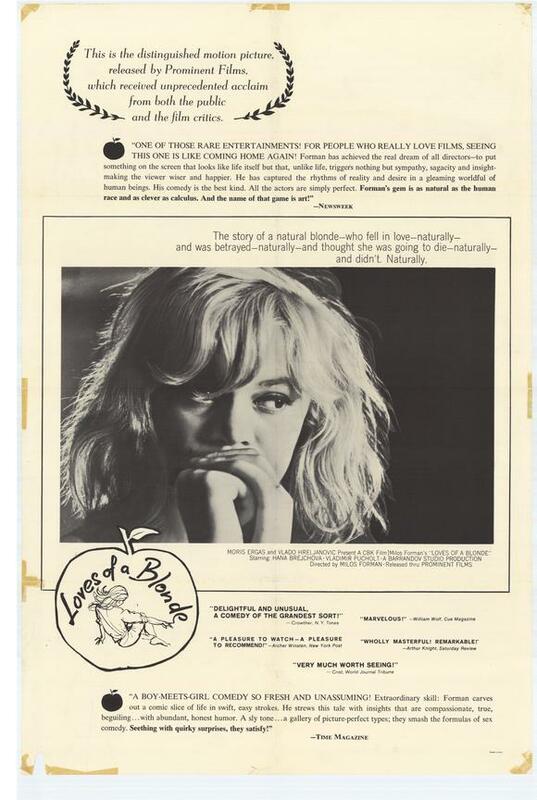 What a wonderful world we see in Miloš Forman's Loves of a Blonde, a seminal artifact of the Czechoslovak New Wave. It's a world where a shoe factory owner lobbies a Czech colonel to station his troops in the factory town so that the girls who work in the factory will have men to love them. (The women, after all, outnumber the men sixteen to one in the town.) Where three army stooges argue like little boys over how to approach a table of cute girls. Where a soldier sees a girl putting a tie on the tree and says, "If you keep doing that, you'll dress up the whole forest." There aren't even any stunning beauties to intimidate us. Forman's film evinces the same free-form quality as the works of Godard or Truffaut, but there's nary a supermodel or foppish midcentury Bohemian in sight. Instead, we get a bunch of grubby, homely teenage girls working at a shoe factory during the day and hoping to find love at night. Brigitte Bardot would probably vomit. Too bad for her. Forman's story follows factory worker and quintessential doe-eyed naif Andula (Hana Brejchová) as she searches for, what else, a boy she can call her own. Though the rest of the girls in town feel the full effect of that sixteen-to-one ratio, Andula has to beat them away with a stick. She vacillates between a handsome but possessive local boy, a married soldier ten years her senior, and a charming pianist who's a bigger schmuck than he initially lets on. She meets the seeming gentleman (Vladimír Pucholt) at a party thrown by the factory owner for the troops the colonel ends up stationing in the town. The party is shot simply, without a trace of glamor or eroticism: just the factory girls and their awkward would-be suitors shuffling through clumsy dance steps. That style pervades the rest of the film, fostering a far more accessible and easy-going aesthetic than those found in contemporary New Waves (the boho pretentiousness of the French, the dour realism of the British). Forman favors loose-limbed, documentary-style photography and unshowy editing, and the style imbues the encounters we see with a realism and charm that's one of a kind. A pretty girl is like a violent crime. The vicious cycle continues, leading us to a spectacularly awkward (and bracingly funny) encounter with Milda's parents, who are none too pleased to see Andula show up on their doorstep while their son is out at a gig. Milda's shrew of a mother (Milada Jezková) invites her in only to berate her for being naive and intrusive. Milda returns home, all sweet cow eyes for Andula and claims of ignorance for his parents. Andula overhears and returns home, crushed. It's a tragedy, but a refreshingly light one. If you're looking for psycho-sexual pretension, stick to the Godards and the Truffauts. I for one quite enjoyed my filmic jaunt to the Eastern Bloc.